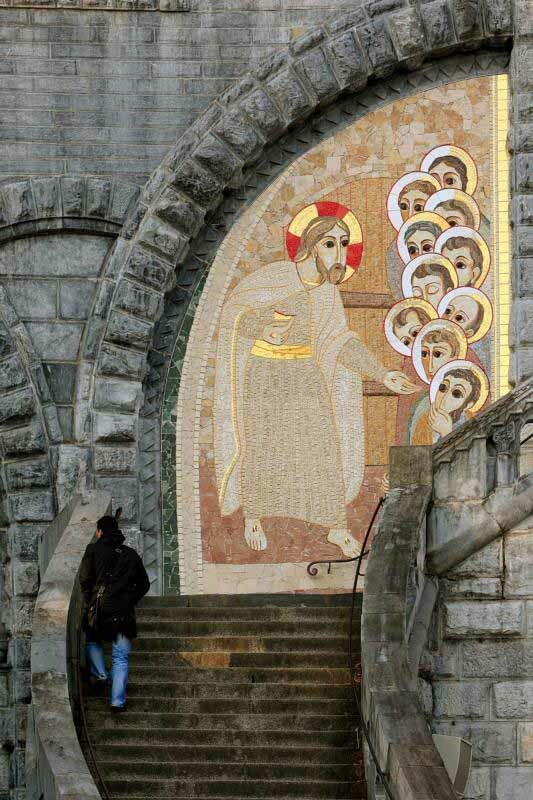 A depiction of the risen Christ appearing to his disciples is seen in a mosaic at the shrine in Lourdes, France, in this 2008 photo. St. Paul tells us in one of the readings for the Easter Vigil: "Just as Christ was raised from the dead by the glory of the Father, we too might live in newness of life" (Rom 6:4). (CNS file photo/Nancy Wiechec) See BIBLE March 9, 2017. What is this “glory of God”? St. Paul tells us in one of the readings for the Easter Vigil: “Just as Christ was raised from the dead by the glory of the Father, we too might live in newness of life” (Rom 6:4). Through our baptism we share in the new life to which Christ was raised. The new life Jesus came to give us was evident already in the signs he performed and in what he taught while on earth. These foretastes of our new life in Christ were fulfilled in the resurrection, which shattered life’s meaninglessness with its message that death does not have the final victory. The Lectionary readings for the Easter Vigil and Easter Sunday highlight different aspects of living out that new life here on earth. In other words, put away your former, sinful ways and replace them with new, authentic ones. We are fortunate in having Lent to help us with that — 40 days to practice replacing a bad habit with a good one. When Easter comes, Lent will have given us a good head start in our process of self-improvement. The idea of sharing the good news of God’s favors to us appears frequently in the Psalms, and in some of the Gospel stories of Jesus’s miracles, the healed person goes off to proclaim the marvel that God has worked for them. Let us continue, at Easter and beyond, to “declare the works of the Lord” by the Christian joy that informs our living. And so we come to the Gospel and the rolled-away stone. 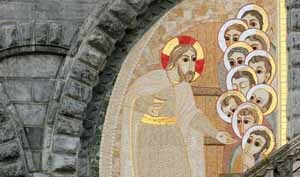 The risen Jesus who suddenly appeared to the disciples in the tightly secured upper room without having to enter through the door did not need to roll away the stone to exit the tomb. The stone was rolled away for the benefit of the disciples who came to the tomb on the first Easter morning and for our benefit — so that they and we could look inside the empty tomb and see what is possible when we open ourselves to new life.